Elaine is a painter from Papulankutja (Blackstone) who now resides at Wanarn Aged Care. 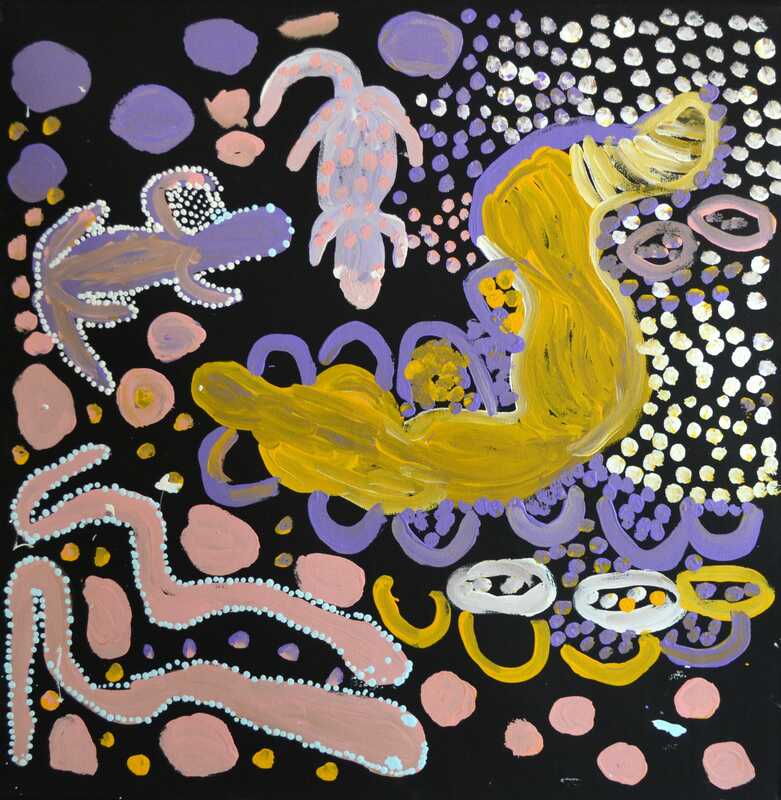 Elaine paints tjukurrpa from her country of Papulankutja, such as the Papulankutja Dreaming as well as tjukurrpa from Lirrun, a sacred site approximately 70kms east of Warakurna in the Sherwin Crescent Nature Reserve.Warakurna ArƟsts works closely with Wanarn Aged Care Facility to conduct painting sessions with elderly patients. This program nurtures artists who have arguably contributed largely to one of the most significant art movements in Australia.The joyous communal activity has a myriad of positive benefits such as reliving boredom and frustration. Health staff report that this diversional therapy helps to reduce patient’s drug intake and the old people rejoice in sharing and passing on their important Tjukurrpa with their families who visit them when the workshops are conducted. Warakurna Artists is a positive and powerful example of Aboriginal businesses managed and governed by artists and community elders ensuring the wealth of talent and economic returns are retained in the community.